Parking is located in Lebanon St. in between Figueroa & Flower off of Wilshire. Valet starts at 4:30PM nightly and is $10 and payment is made in advance. 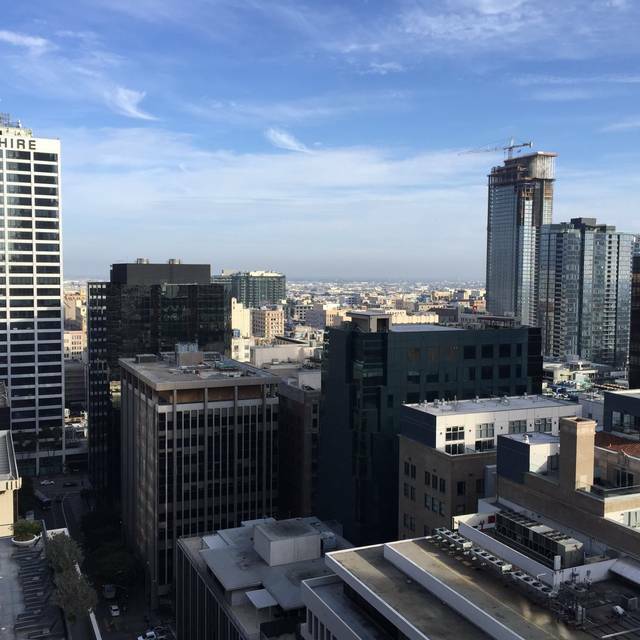 For lunch, we validate for 90min at the parking structure located at the Northeast corner of Figueroa & Wilshire. Parking is $5 with validation. The Metro station is located 1 block south at 7th & Flower. After dining, visit Elevate Lounge for dancing and cocktails. Elevate is open to the public Friday & Saturday from 10PM to 3AM. Friday & Saturday cover is $20 per person. 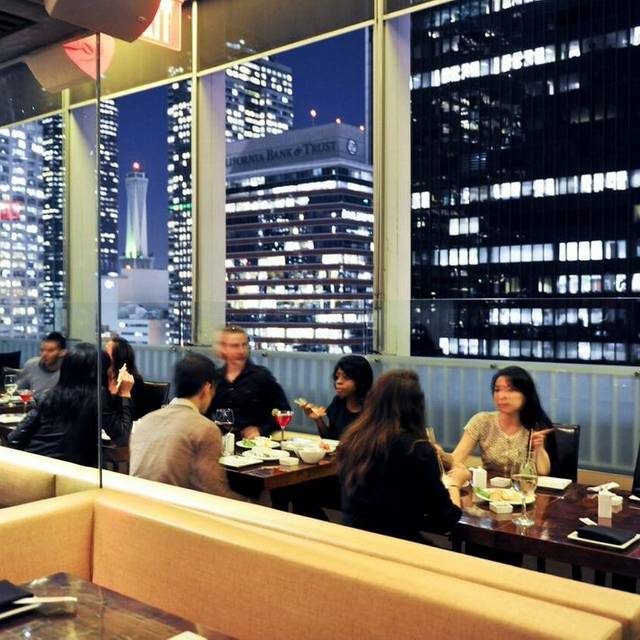 Having dinner in Takami does not guarantee entry into Elevate. For bottle service/ table reservations, please contact Taylor at reservations@elevatelounge.com. 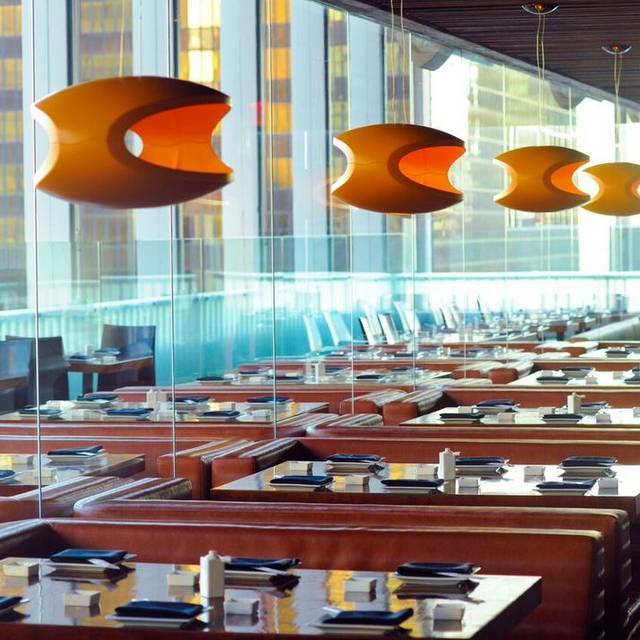 There is also complimentary taxi transportation to Staples Center & The Music Center when dining at Takami. 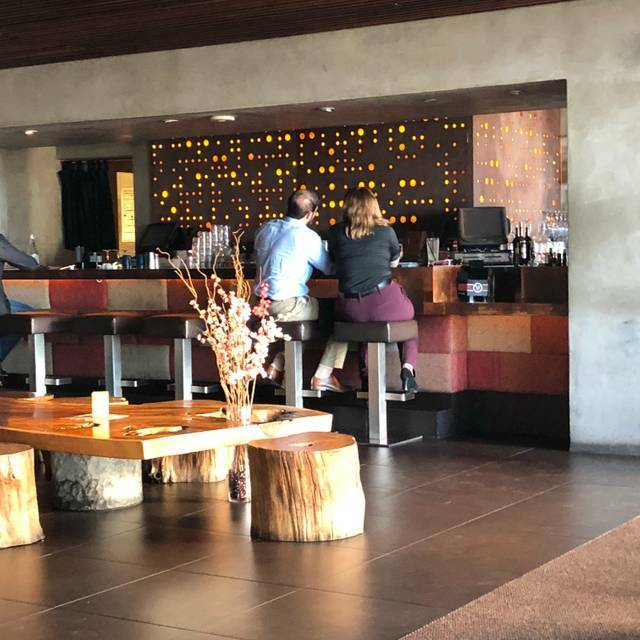 Takami's outdoor lounge is the perfect setting for corporate happy hours and small social gatherings for groups up to 40 guests. Reservations must be made in advance with Special Events Manager. Off-site to go orders for groups of 30-80 guests are available. Please arrange with Special Events Manager. 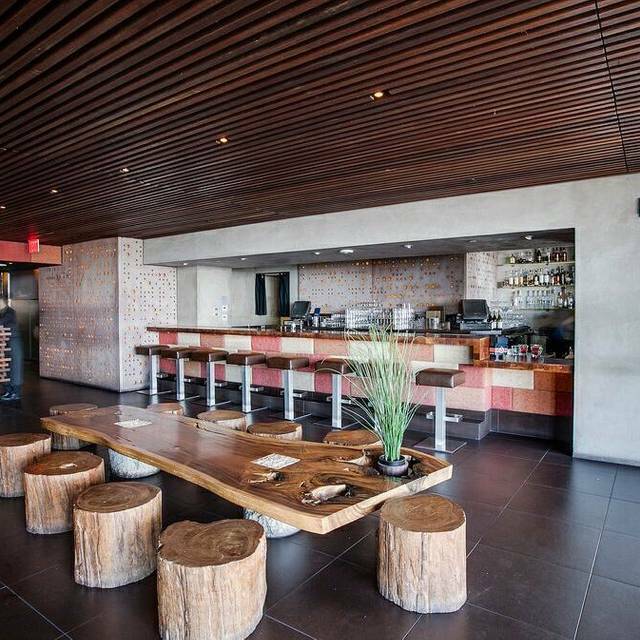 Floating 21 ﬂoors above Los Angeles, the Kimono Room and scenic patio of Takami provides unparalleled views for guests of private events. The Elevate Lounge features an open ﬂoor plan, modular and customized seating, and is uniquely positioned to accommodate exclusive events up to 500 guests. 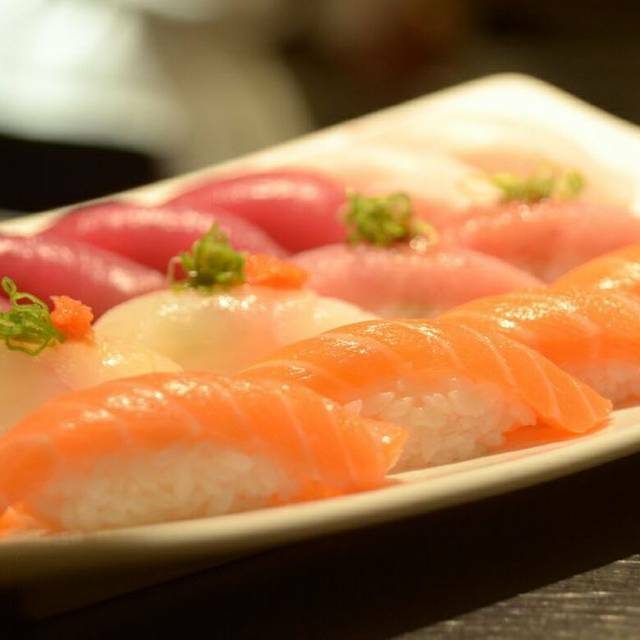 Takami Sushi & Robata restaurant offers only the highest quality sushi grade fish. Featuring 3 kitchens, Sushi, Robata and Asian Fusion. 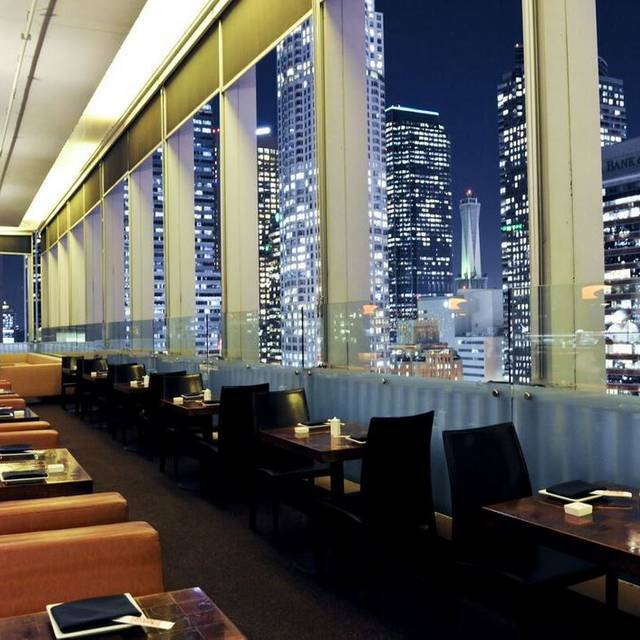 Takami is the only restaurant located in Downtown LA offering outside dining 21 floors above the city with 360 degree views of Los Angeles. Full bar along with extensive wine and sake list. Happy Hour is offered 7 days a week in our lounge. ❤ It!!!! Food was perfect and the view and ambience was Amazing!!!! It was just MEH.. wednesday night out we were celebrating my husband's birthday, which i specified in my online reservation and also told Andrew the manager, and no attempt was made to make our evening any more special than a casual night out.. Food and drinks were pricey, which is expected from a restaurant on the 21st floor in downtown LA, but what bothered us was that our server was just going through the motions. He seemed to be on a permanent break (was no where around when we needed him), the bus boys and food delivery guy were the only ones that really served us. Got one of the first things we ordered wrong, had to send it back. At a higher end restaurant i would at least expect him to come around and ask if we would like a second round (especially since we are celebrating..) nope. Had to have one of the bus boys flag him down to ask for a second round. Was expecting a lot more and was just left a little disappointed. Step up your customer service game (overall) if you expect people to pay the higher prices for mediocre sushi that you can get anywhere else in LA. Thats all. Walking through an alley and passed a dumpster from the valet to the entrance started off our evening. We were seated and told that Thursday nights are half off wine bottles and sake bottles. I should have mentioned at that time that I purchased a Groupon – please note the Groupon was just $100 for $60 meanin Walking through an alley and past the dumpster from the valet to the entrance started off our evening. We were seated and told that Thursday nights are half off wine bottles and sake bottles. Our waiter was lovely and knowledgeable. The food came out randomly and sporadically, some of it was delicious and some of it was flat out awful. Our waiter graciously offered to take items off our bill that we didn’t like or replace them so that was very nice. However, the fact that some food was great and Sam was in edible truly means that we will never eat there again. Our bill for five people Dash three adults and two children – was over $350. Absolutely outrageous. The restaurant commands attention upon entering, especially the view. All staff member encountered were very friendly and our waiter was extremely helpful in describing the entrees we were interested in. All our food selections were delicious. The king crab rolls were my favorite. The sauce brought out distinctive flavors in the crab that I totally loved. To drink I had the lychee mojito. This drink is delightful and enjoyable. If you like lycee this is a must-try drink. Went for our anniversary and it had amazing food and a great environment, at reasonable prices. Definitely going again. I thought that the price was a bit too much for the amount of sushi we were served. Also there was a lot of wind outside where we were sitting and they did not shift us to another table. Best Sushi that i’ve Had. Great presentation and awesome view at night. We love Takami! Beautiful date night spot. Gladys was our server and took really good care of us. All the managers came by our table to check on us throughout the night. Our favorite dishes were the lemon roll, yuzu tiger roll, peppered ahi tuna, and the salmon carpaccio. The lychee martini was delicious too! Looking forward to another fun night out there soon! Father daughter date night. I used Open table and asked for a window table. They hooked us up and the waiter portioned out a delicious menu of Takami's best dishes for us to enjoy. Views were spectacular and a wonderful date night with my kid!!! We'll be back! Awesome service and food was amazing! Very classy atmosphere. Nice restaurant with fabulous views. Nice for special occasions. Service was prompt and courteous. I enjoyed the atmosphere and view was fantastic. Our waiter was very courtesy and helpful. The food was very good and fresh. This is always a great LA restaurant to visit. Nice place for a date. Prices aren’t too expensive. Celebrating an end of one amazing chapter in life and the entering of a new one. The manager, Andrew, and his staff were very accommodating and nice. They were also very helpful and made us feel at home. Great sushi, service, and location! We were seated right away. The view from the restaurant was amazing. Amazing views, amazing food, even better service. Megan served us and was a delight. We will certainly be back. We were seated at a nice window view for our anniversary. The food was great (tasted so fresh). The environment was lively. The staff gave good service. I would definitely recommend this place. The staff was nice enough to hold our reservation despite the fact that we were running late. Great place! Great staff! Food was great! View was great! Takami always has good food and good service. Food is excellent. I had the Bento box with a NY Steak which was grilled just as I asked. I like the outdoor patio but the street noise coming up from from below can be intrusive. TaKami is a very nice restaurant. The ambience is very sofisticated, and there are outside tables with a view to the LA Skyline. Prices are above average for a Japanese restaurant. Service was not so good. waiter disapearing. Dirty dishes, drinks (beer and coca cola) taking quite a while to arrive (almost 10 mins). It was a nice place but service needs to be improved. Restaurant was not even half full. The food was average. If it wasn’t for the Groupon deal, I probably wouldn’t have gone. The price is quite high for the quality of food. Nice view though! Excellent service, food was great. Takami is a true gem. The sushi is incredibly delicious, the drinks are varied and inventive, and the view is spectacular. Add in friendly and professional service, and you have the perfect place for a fantastic meal and great night out! It had been a long time since I took myself and my date to such a nice place. A bit pricey for me so I won't go often but my time there was worth it. My date and I enjoyed a open window table with a great view. The staff was wonderful and attentive. Exceptional in every regard. We really enjoyed Andrew, the GM, as he was making rounds checking on his guests. We got him to stop again at our table and we shared stories and jokes. Got that old school feeling like they care. And the food was great. Especially the Robata! We were the last to leave and they never rushed us out. For me it was a special night out I will always remember. Great atmosphere. Food was good and fresh. Service was a little slow. Amazing service, amazing food!!! I dont know what else. This place is a must for anyone who loves great sushi, great service and great ambiance!!!! Food was good but not great. Sushi was fresh. I enjoyed that the most. I didn’t think the other types of plates were so great. Oversauced and too complex. I am a Japanese foodie and this was more of a fusion restaurant. The food was fantastic, we enjoyed everything we ordered. The waitress we had was very friendly and helpful too, but we found that service took a long time- perhaps they were under-staffed that day (Sunday). There was a party going on which caused the noise levels to be high, and a weird draft which felt strange coupled with the heaters at full-blast above our table. So that made the ambiance a little uncomfortable. We also mentioned in our reservation that we were celebrating our engagement, but no one ever acknowledged it. And the hostess at the door was a little rude. The bartender on duty ignored us mid-order to speak to another customer too, so that put a little bit of a damper on the night. But the food was good enough that we would go back. 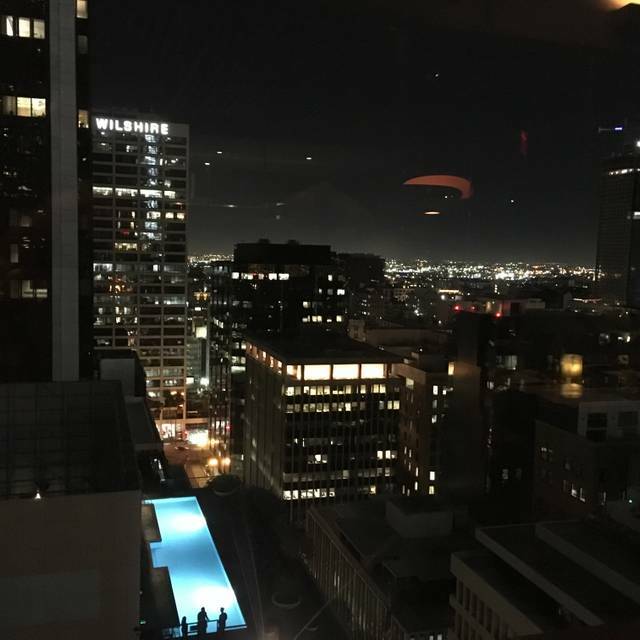 Takami was an amazing place to celebrate my girlfriend's birthday. The food was extremely tasty and satisfying. The drinks we ordered were also extremely well made and each had a particular flair to them. I also appreciated the fact that the Manager, Ace, came around and introduced himself to each table. He also help light a candle on the chocolate cake we order for my girlfriend's birthday. I was truly impressed with the overall experience! 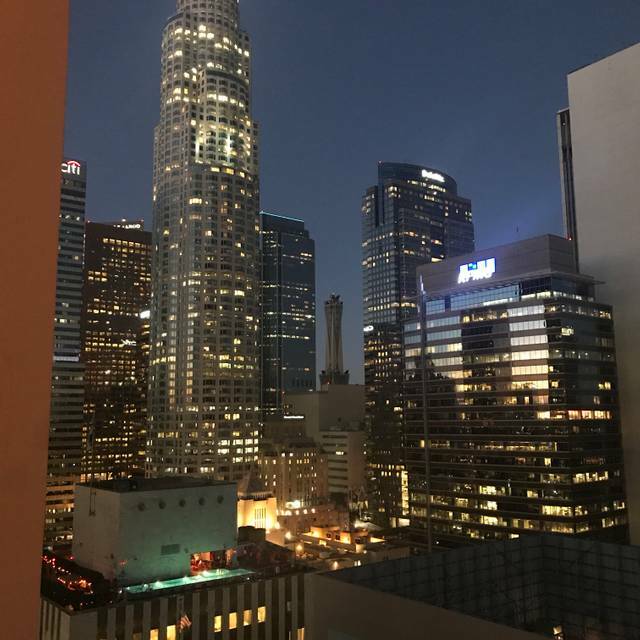 We loved the food, and had a great view of DTLA from our balcony seats. I love the atmosphere and the view. The food was delicious. Service was great as always. We had reservations at 9:30pm and we were seated shortly after. After dinner we went next door to Elevate and had a blast. Ace, the manager, was the best! He was incredibly welcoming from the start and led everyone to their table. He introduced himself pleasantly and welcomed us to the restaurant. Ace gave incredible recommendations and all of the food was sushi. Ace was aware of what every guest was feeling and adjusted the restaurant to better fit everyone’s needs. He even offered us blankets when it hit chilly! I highly recommend this spot for any special occasion, delicious sushi, delicious dessert, or an incredible view of downtown LA. We’ll be sure to come back here soon!